ATS Event: Big Sur Rebuild! Big Sur Landslide was a landslide that occurred in May 2017 on the Californian Highway 1. People are working to this day to restore the highway so SCS had an idea to help them rebuild faster! 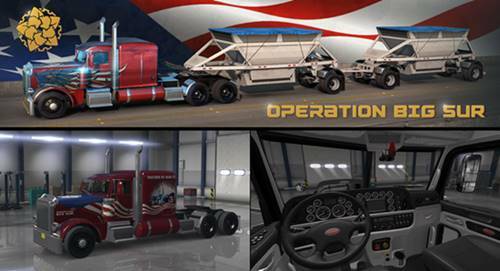 This is a new Word of Trucks event for American Truck Simulator! Participate now and win great prizes! Deliver 15 gargos of material and equipment either to or from Big Sur Lanslide on CA Highway 1. The entire American Truck Simulator trucking community will need to make at least 500,000 deliveries to complete the challenge. You can track the community progress on the front page of the World of Trucks.